A growing number of colleagues see it as part of their role as a dentist to listen to anxious patients, to understand their fear and help them through their appointment. Not only do they believe in supporting patients, they want to encourage those who never cross the threshold of a dental practice – around 50% of the UK population – to be more confident about seeking treatment. Dentists who are good at managing anxious patients are generally willing to invest in the techniques and products which will improve the patient experience. You only have to read the other excellent articles on this site to appreciate the authors’ commitment, both professional and financial, to helping anxious patients. And they are not alone. A growing number of dentists see it as part of their professional responsibility. Colleagues who fall into this category are buying Vibraject, the small vibrating device which helps eliminate the pain of a dental anaesthetic. Vibraject is attached to a standard syringe and makes the needle vibrate. The high frequency vibration of the needle stimulates the nerve endings and blocks the transmission of pain feelings to the brain. This conforms to the Gate Control Theory of Pain Mechanisms introduced by psychologists Ronald Melzack and Patrick Wall 1. The theory is based upon the finding that sensations of pressure and vibration successfully compete with sensations of pain for transmission to the brain so the vibrations essentially mask the patients’ discomfort during injections. What are the uses of Vibraject? Vibraject is effective for all types of injections, including intra-ligamental, palatal and blocks. One of the most persuasive factors for me is that I can continue to work as I have always done. Apart from the batteries, Vibraject requires no disposable items which increase overhead costs. The clip bracket is autoclavable and is intended to remain on the syringe during sterilization, while the motor cartridge, which should never be autoclaved, is easily removed and wiped with a disinfectant. It can also be very useful in endodontic disinfection procedures. The Vibraject unit is simply attached to the irrigation syringe and uses sonic vibration, common in debridement procedures, to dislodge material from the root canal. How do people know that you offer Vibraject? There is now a network of more than 100 dental practices with at least one Vibraject and a map on the website so patients can find the nearest to their home or workplace. We also supply stickers so practices can promote Vibraject to patients. Once word gets round, patients will ask for “the buzzy thing”. Dentists with Vibraject usually find that new patients come to the practice because a friend has mentioned the pain-free injecting device. As you can tell, I am a fan of Vibraject and have become its UK and Europe distributor because of the impact it has on patients. I love the fact that they often think they haven’t had an injection at all. Just as powerful was the response I had recently when I treated my colleague Bethan Fletcher, who works in my practice. She routinely uses Vibraject on patients, but only on patients who ask for it. In contrast, I use it on all my patients. But that has changed. WE are now a Vibraject practice. Bethan had her first personal experience of Vibrjaject when she needed a local anaesthetic prior to an extraction. She said afterwards she felt nothing when I gave her the injection and she thought it was “absolutely fantastic”. Now, she says, all patients who need a local anaesthetic will in future have an injection delivered with Vibraject. If the number of dentists wanting to provide pain relief to patients continues to grow, and I hope it does, perhaps as a profession we can start to reach those who avoid the dentist at all costs. The Adult Dental Health Survey 2 showed that 41 per cent of patients suffer from dental anxiety and that the pain associated with dental injections is one of the most feared aspects. 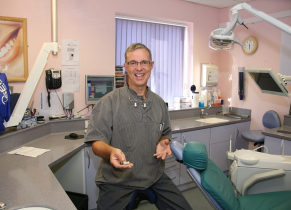 Now that we have equipment and materials which are effective, it is over to us to demonstrate that we can make treatment free from pain and a dental appointment can be enjoyable. Murray Hawkins is the Lead Clinician at Bupa Dental Care (formerly Winning Smiles), Gillingham and the distributor of Vibraject in the UK. For more information, visit the Vibraject UK website. Author: Murray Hawkins BDS. Last reviewed by Dental Fear Central on October 28, 2018.